"Baruch Spinoza never made it to America, nor did he include it much in his philosophizing"
"The settlers of New Netherland were obligated to uphold religious toleration as a legal right by the Dutch Republic's founding document, the 1579 Union of Utrecht, which stated that "everyone shall remain free in religion and that no one may be persecuted or investigated because of religion." For early American historians this statement, unique in the world at its time, lies at the root of American pluralism. 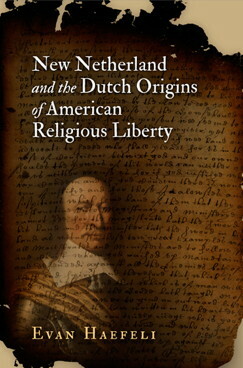 New Netherland and the Dutch Origins of American Religious Liberty offers a new reading of the way tolerance operated in colonial America. Using sources in several languages and looking at laws and ideas as well as their enforcement and resistance, Evan Haefeli shows that, although tolerance as a general principle was respected in the colony, there was a pronounced struggle against it in practice. Crucial to the fate of New Netherland were the changing religious and political dynamics within the English empire. In the end, Haefeli argues, the most crucial factor in laying the groundwork for religious tolerance in colonial America was less what the Dutch did than their loss of the region to the English at a moment when the English were unusually open to religious tolerance. This legacy, often overlooked, turns out to be critical to the history of American religious diversity."